Jen-eral Health: I miss my doggie! Ten years ago, I decided I wanted to bring a puppy into my life. I saw an advertisement in the newspaper where a lady was selling Chihuahua puppies. I quickly called, made an appointment to see them, and went the next day. As I walked up to the box, I saw about six of them. They were TINY! haha, I loved it! They were only seven weeks old. While five of them were wrestling, one was just laying there. I picked her up and placed her in the palm of one hand. As I held her, she looked up at me and I said to myself, "this is the one!" I took her home that same day and took care of her as if she was my newborn baby. I watched her to make sure she was safe, clean, and well fed. At night she would cry because she was hungry, so I would get up to warm goats milk for her. As she drank it, her stomach would fill up and she looked like a little fur ball. I continued this until she was old enough to eat dog food. Once she got older we became BFFs, we were inseparable! Even though she was so small, she made me feel protected. At times, I would stop to think, "one day she will pass, so I need to cherish these moments." I did... I cherished every moment with her. There was a very nice family that ended up taking her. I talked to the lady the next day and told her it was very hard for me to let her go and if she ever decided she couldn't keep her to please let me know. She was very nice and told me she understood. She told me she was adjusting well and woke up to find her husband cuddling with her. I was also told she made a new friend with her other dog. They were in the backyard running around playing. After talking to her, it helped me in letting her go. My last thought of her is knowing that she is happy, so that made me feel better. She was a dog, but she was everything to me. It's hard for me to think about her, but I will never forget her. This whole experience has taught me that I can let go of something or someone special and survive through it. Once I let her go another door opened for me and now I am able to focus on myself. 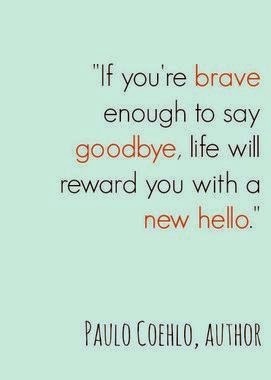 Like the quote above says, "it rewarded me with a new hello."